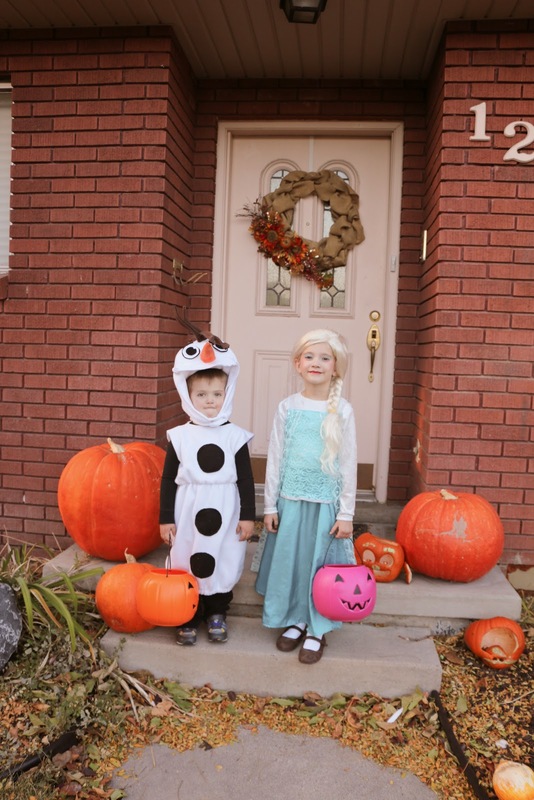 These two crazy maniacs wanted to be Olaf and Elsa for Halloween, and despite my best efforts to sway their costumes of choice, they were dead-set on dressing as these popular disney characters this year. 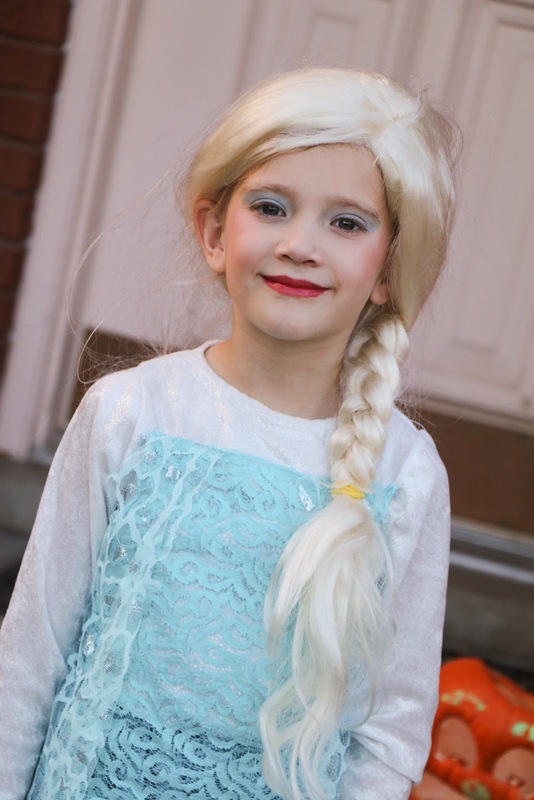 I knew there would be millions of children dressed up as characters from Disney's Frozen so I decided to let them be unique in their own way by sewing each of their costumes myself. 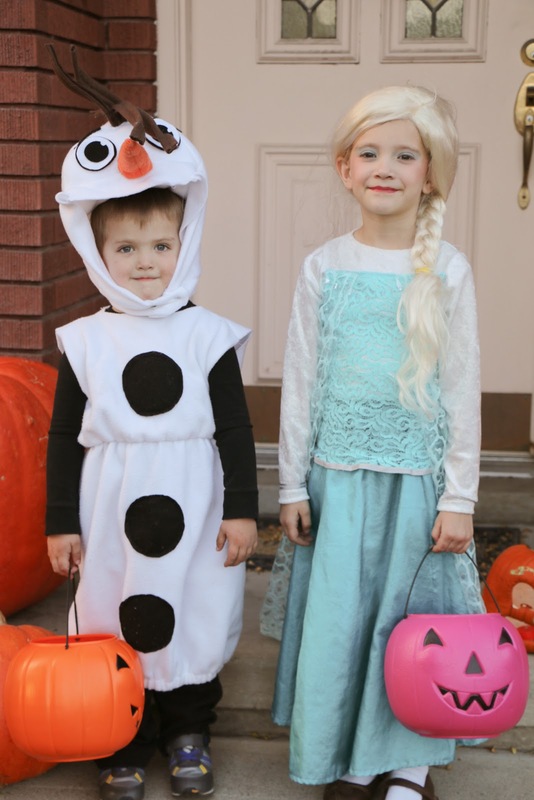 I sewed these without patterns, so no other Olaf or Elsa costume in the world is the exactly like these. Liliane and Wesley probably would not have cared if I bought run-of-the-mill costumes from the store, but I saved a good chunk of money sewing them myself, so the fact that they were one-of-a-kind was an added bonus. 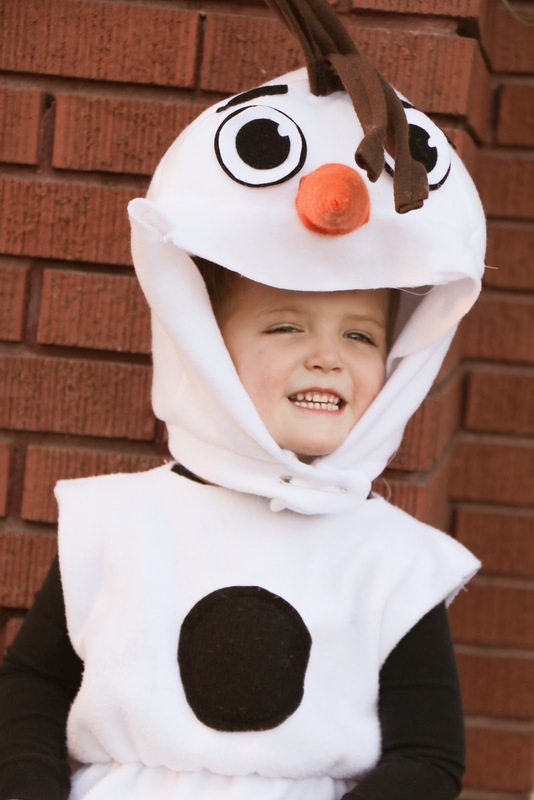 Wesley was thrilled to be Olaf. He was so good to let me keep trying the costume on him as I went about sewing it to make sure that it fit just right. The Olaf head was completely improvisational. I used the same white fleece fabric as the costume body stuffed the head with batting so it would keep it's shape. I used felt for the black buttons on the body, the eyes, eyebrows, and carrot nose. Even though I didn't have a pattern and I was completely winging it, I was glad it turned out decent enough to be recognizable. 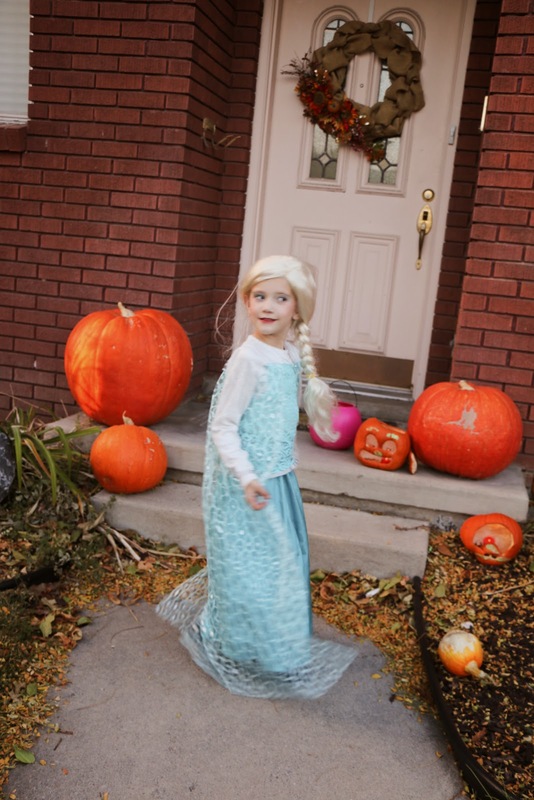 I started Liliane's Elsa costume by making the white dress out of a shimmery velvety knit fabric. I used a knit dress that she already had as a basic outline. The white dress was made floor-length to make the dress warmer with the extra layer. It also acted as a buffer between her legs and the satiny fabric I used for the costume skirt. The lace bodice and cape were sewn directly onto the white dress, and the blue satiny skirt was sewn separately with an elastic waist. We ended up reusing the blond wig we had in storage from Liliane's garden gnome costume from 2012. 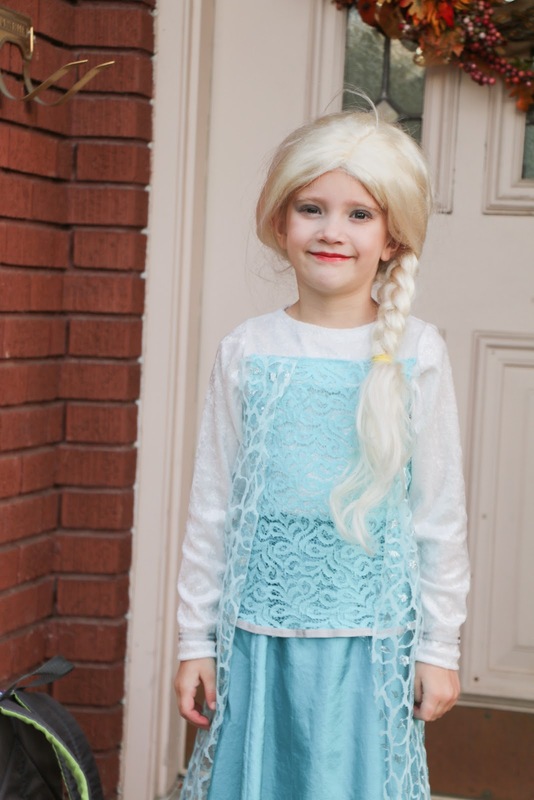 I gathered the wig to the side and braided it to simulate Elsa's lovely golden locks. Liliane loved wearing the wig! She wore it for days leading up to Halloween. I think Liliane's favorite part of the whole get-up was the fact that she got to wear make-up, too. Liliane insisted that I take a picture of the back of her costume to show the pretty cape that was attached. She was quite particular about how I constructed the dress, and was so sweet to thank me with big bear hugs when I finished sewing her costume. Her heartfelt thanks made my crazy day of mad sewing all worth it. Jordan was scheduled to work Halloween night, so I took the kids out trick-or-treating with my brother and his wife and kids. The weather outside was fairly warm and a bit windy. Considering Utah's unpredictable weather patterns during this time of year, the weather really was pretty awesome.